I came across this article written by the late Hal W. Hendrick, and was immediately impressed with his early recognition that the successful path forward for the field of ergonomics was to capture and promote the economics of ergonomics. Hal wrote this article in 1996, and it applies today as much as it did then. I’ve summarized the article below, including his numerous examples of substantial economic returns produced by applying ergonomics and ergonomic principles. … I know of no profession where so small a group of professionals has such a tremendous potential for truly making a difference. In light of our potential, why is it, then, that more organizations, with their strong need to obtain employee commitment, reduce expenses, and increase productivity, are not banging down our doors for help, or creating human factors/ergonomics positions far beyond our capacity to fill them? He then asks why it is that so many in industry and in government see ergonomics as something that will increase costs and decrease competitiveness, and points to several possible reasons. Exposure to bad ergonomics. Citing Ian Chong’s use of the phrase “voodoo ergonomics” to describe this concept, wherein products that have no ergonomic features are presented as “ergonomically designed,” or cases where “so-called ergonomics” is performed by incompetent practitioners, Hendrick identifies the importance of professional training and certification, and the standards needed to support them. In my 35 years of experience in this field, I can think of no application of our technology by myself, close colleagues, or in collaboration with my students that did not have a positive benefit for the organization that more than justified the cost. To prove his economic case, Hendrick shared a variety of examples where ergonomics had been proven beneficial, recognizing that these were some he had collected, but that there were many more examples in these and other industries. Below are a few he recounted (remember that his article was published over 17 years ago! ), interested readers are directed to the full article, cited below, for details and additional examples. Leg protectors redesigned using anthropometric methods and field testing saved $4 million annually. Vehicle seating and visibility improvements with a one-time cost of $6,900 produced hard-cost savings of $65,000 annually in reduced equipment damage and increased productivity. Through a systematic redesign (evaluation, analysis and design) of alternative mission kits carried by C-141 military cargo planes, Hendrick’s solution saved over $2 million in initial aircraft fleet costs. Further, the improvements greatly simplified the system, reduced operational aircraft weight, reduced installation time and labor and storage requirements for a fleet of 200 aircraft, resulting in untold reductions in operational costs over an operating period of 35 years by the time Hendrick published this account. An ergonomics study of modifications to the original aircraft throttle system that had been identified as too sensitive to pilot inputs (thus making it difficult to accurately control aircraft speed) demonstrated the proposed modifications to be safe and effective, eliminating the need for a very costly system redesign. Steel pipe and rod handling and storage system: noise levels reduced from 96 dB to 78 dB; 10% productivity increase; quality improvements in the form of a 1.5% reduction in rejection rates; the entire project costs were recovered in 18 months; “After that, it was all profit,” Hendrick explained. Replacement of a forge shop manipulator with one that was ergonomically designed: noise levels reduced to 18 dB; sick leave reduced from 8% to 2%; improved productivity; and an 80% reduction in maintenance costs. Ergonomic redesign of tube handling and storage: reduced noise levels to 20 dB, increased stock-keeping methods that resulted in a 15 month payback for the investment. Replacement forklift truck design: Citing work by Alan Hedge (Cornell University), a team performed “inside-out” human-centered approach to complete redesigns of two forklift trucks produced by Raymond Corporation. The team set out to maximize operator comfort, minimize accident risk and improve productivity by designing the form of the truck around operator needs, including anthropometry, task requirements and comfort. One of the new designs was a finalist in a “new product of the year” competition sponsored by Modern Materials Handling magazine, and the company’s new product line helped stem Raymond’s declining market share and raise its stock price from roughly $6/share to $21/share by the time Hendrick documented this example in 1996. Improvements as simple as changing ALL CAPTITAL LETTER headings to Mixed Case Headings and highlighting the appropriate listings on the computer displays for directory assistance operators reduced per call times by 600 ms, which may seem insignificant, but resulted in savings of $2.94 million per year across the company’s multi-state operations. Training was reduced from 5 days to 1.5 days by introducing ergonomically influenced computer-based training with simulated work environment and error feedback. 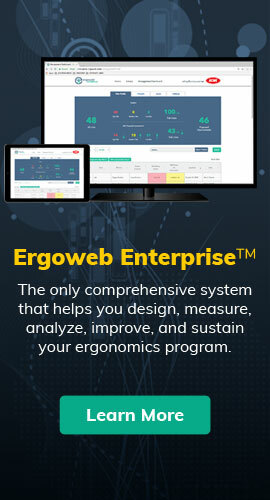 A macroergonomics approach involving participatory ergonomics was utilized by Andy Imada and George Stawowy to redesign two food service stands at Dodger Stadium in Los Angeles, CA, USA. Before and after measurements demonstrated an 8 second reduction in average customer transaction time, which translated into a $1200 productivity improvement per stand, per game, “resulting in a payback period of 33 games, or 40% of a single baseball season,” as well as an improved customer experience. Once proven on the two stands and streamlined for further expansion, applying the same improvements to 20 other stands in the stadium had the potential to create a 20 game payback period per stand. In 1979 Deere and Company (aka “John Deere”) “recognized that traditional interventions like employee lift training and conservative medical management were, by themselves, insufficient to reduce injuries.” They embarked on an ergonomics improvement process that reduced exposures through design. The process included facility coordinators and teams trained in ergonomics with representatives from engineering, safety and wage-employees. By 1984 they had reduced workers’ compensation costs by 32%, and the time Hendrick wrote his account in 1996, they had reduced the incidence of back injuries by 83%. NYNEX, a “baby bell” telephone company, had proposed a new work station for operators that by all appearances would improve performance, but when ergonomics researchers applied GOMS models (goals, operators, methods & selection rules) they found that the new design resulted instead in 4% slower service. The findings stopped the company from implementing the inferior solution across 100 workstations, saving the company $2.4 million. It’s hard to believe that Hendrick wrote this article over 17 years ago, yet as a field, we sometimes still struggle to demonstrate the significant value of ergonomics to skeptical companies and consumers. As he pointed out, the skepticism some show is influenced by the misuse of the term ergonomics by advertisers and incompetent practitioners; by the perception that ergonomics is “common sense;” because we sometimes assume people will follow our advice simply because it’s the “right thing to do;” and because ergonomists don’t always do a good job documenting and promoting their value. … I know of no profession where so small a group of professionals has such a tremendous potential for truly making a difference … for virtually every person on this globe. We miss Hal Hendrick, but we’re very grateful for his long-lasting wisdom and legacy. Hal Hendrick, (1996). The Ergonomics of Economics is the Economics of Ergonomics. Proceedings of the Human Factors and Ergonomics Society Annual Meeting, 40:1. DOI: 10.1177/154193129604000101. http://pro.sagepub.com/content/40/1/1 (subscription required). This article originally appeared in The Ergonomics Report™ on January 13, 2013. It is reprinted here, with minor revisions, with permission.